CSEA was active in every part of the state in this year’s elections. CSEA-endorsed candidates across the state were largely successful in their elections to local and state offices. Union activists across the state campaigned on behalf of endorsed candidates in their areas. In the Southern Tier, Fred Akshar was overwhelmingly elected to the state Senate in a special election for the 52nd District. CSEA activists made thousands of phone calls in support of Akshar, a Broome County undersheriff. CSEA members’ efforts also paid off in Schenectady, where Mayor Gary McCarthy, who was endorsed by the union, fended off another challenge from Roger Hull. In the City of Poughkeepsie, CSEA-endorsed candidate Rob Rolison was elected mayor. CSEA efforts are also being credited with a tight margin in the Town of Patterson supervisor election, where the union’s endorsed candidate, Democrat Andrew Falk, is down by only 32 votes in the Republican stronghold town. More than 100 absentee ballots will determine the race’s outcome. On Long Island, CSEA efforts were successful in numerous races, including the re-election of Southampton Town Supervisor Jay Schneiderman. The union’s endorsed candidates won all of the Town of Hempstead races and City of Long Beach council seats. In New York City, CSEA-endorsed candidate Alicia Hyndman easily won a special election for a vacant New York State Assembly seat in Queens. In the Town of Lancaster in Erie County, CSEA endorsed candidate Johanna Metz-Coleman defeated the incumbent town supervisor, who had been a champion of the Tea Party and created a very poor working environment for CSEA members. CSEA Central New York DDSO Local activist Cherie Casler, left, poses with her sister and co-worker, Theresa Young, during the 105th Annual Delegates Meeting in Buffalo. During the 105th Annual Delegates Meeting in Buffalo, hundreds of CSEA leaders and activists were empowered to face the union’s challenges and lead CSEA into the future. With the ADM theme being, “My Union, Your Union, Our Tomorrow,” all of the week’s training centered around Strong Communities Work and Member Engagement. Specifically, programs taught delegates how to engage members and how to partner with organizations and activist to expand economic opportunities. CSEA aims to have delegates bring the information and skills they have acquired back to other members so they can be used to strengthen the labor movement. This year’s meeting was the first of its kind. Activists were able to develop their union and leadership skills through a coordinated series of learning tracks that were focused on specific needs, including certification for required officer and representation training. The five-day meeting also included powerful addresses from A. Philip Randolph Institute President Clayola Brown and AFSCME International President Lee Saunders. CSEA President Danny Donohue also recognized Statewide Treasurer Joe McMullen for his service to the union. McMullen is retiring early next year. The week also included delegates stepping up to support one of their union sisters. Central New York DDSO Local member Theresa Young is undergoing treatment for a rare form of breast cancer. Hundreds of delegates wore pink “Team T” t-shirts during the meeting to support not only Young, but others who have been affected by cancer. Central New York DDSO Local members, including Young’s sister, Cherie Casler, and other supporters from the Central Region will also participate in the American Cancer Society’s Making Strides Against Breast Cancer Walk in Syracuse on Sunday, Oct. 18. Hundreds of CSEA members will participate in walks in their regions throughout October. The meeting also included several awards. Western Region and Erie County Local activist Judi Knight was honored with the Nadra Floyd Award for Organizing, while Long Island Region and Nassau County Local activist Lynne Kramer received the Membership Achievement Award. 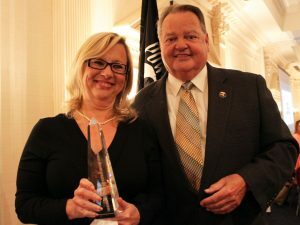 SUNY Upstate Local and Central Region activist Gloria Smith received the PEOPLE Recruiter of the Year Award, and the Central Region took home the PEOPLE Cup. CSEA also honored three activists with its Mission Achievement Award. Central Region Judiciary Local President Don Lynskey received the State Mission Achievement Award, Poughkeepsie City School District Unit activist Tyreck Douglas received the Local Government Mission Achievement Award, and Fulton Center Nursing Facility Local President Migdalia Perry received the Private Sector Mission Achievement Award.